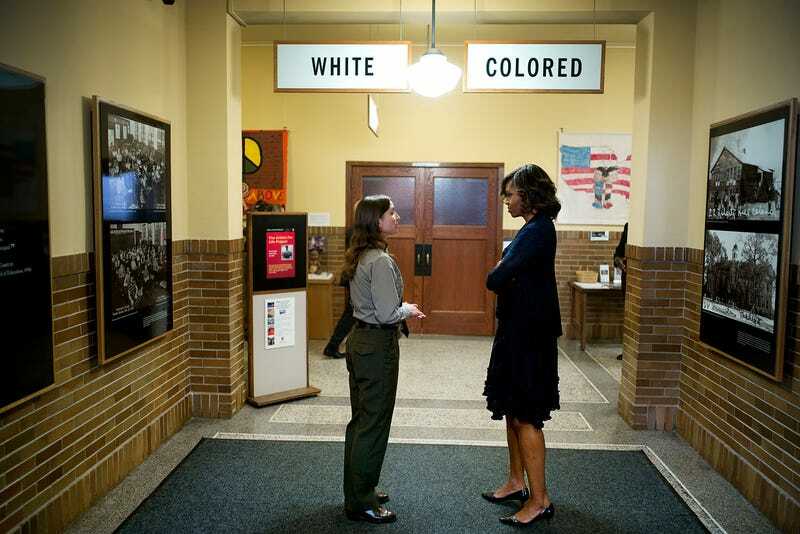 First Lady Michelle Obama and Stephanie Kyriazis, Chief of Interpretation and Education, mirror the past of segregation in a photo released by the White House. The image was taken on May 16th of this year during a tour of the Brown v. Board of Education National Historic Site in Topeka, Kansas. It feels a bit cliche, but this is a truly compelling photo, both of Michelle Obama, and depicting race in America. We often talk about the importance of having the Obamas in the White House for reasons that go beyond just the political. Many tend to forget how recently systems like slavery and segregation were in place in this country. Just fifty years ago, our First Lady would not have been allowed to use the same bathroom as the woman she is facing. When people talk about the impact of just the visual of the Obamas—simply seeing them occupy spaces that no other people of color, black or otherwise have ever been in in America, they're talking about images like this.